Former president Bill Clinton and Secretary of State Hillary Rodham Clinton allowed a statement about their “great pride and overwhelming emotion,” and their staff offered a few grace notes about the interfaith ceremony, which was conducted by Rabbi James Ponet and the Rev. William Shillady. 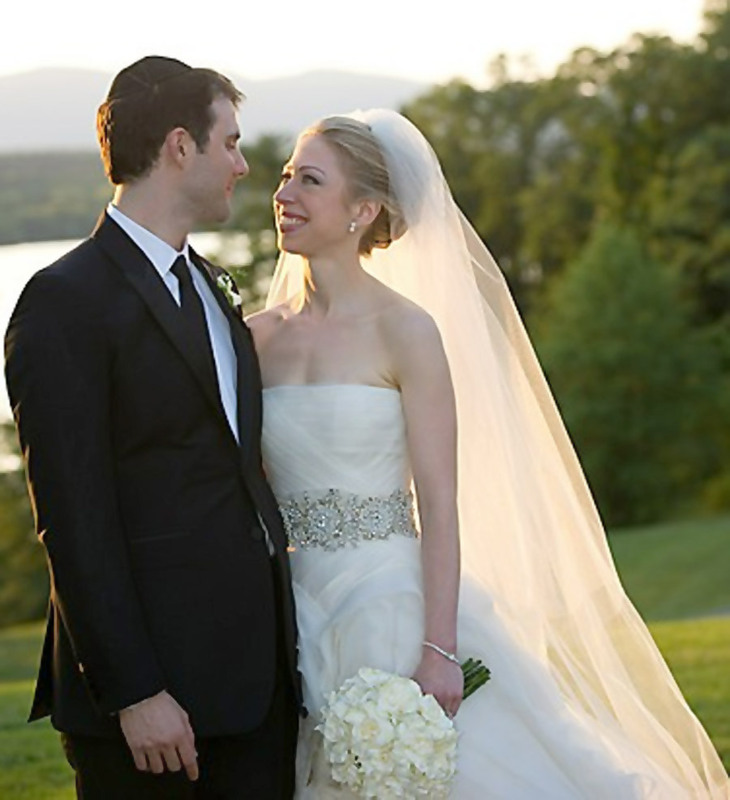 (Mezvinsky was raised in the Jewish faith, while Clinton is a Methodist.) 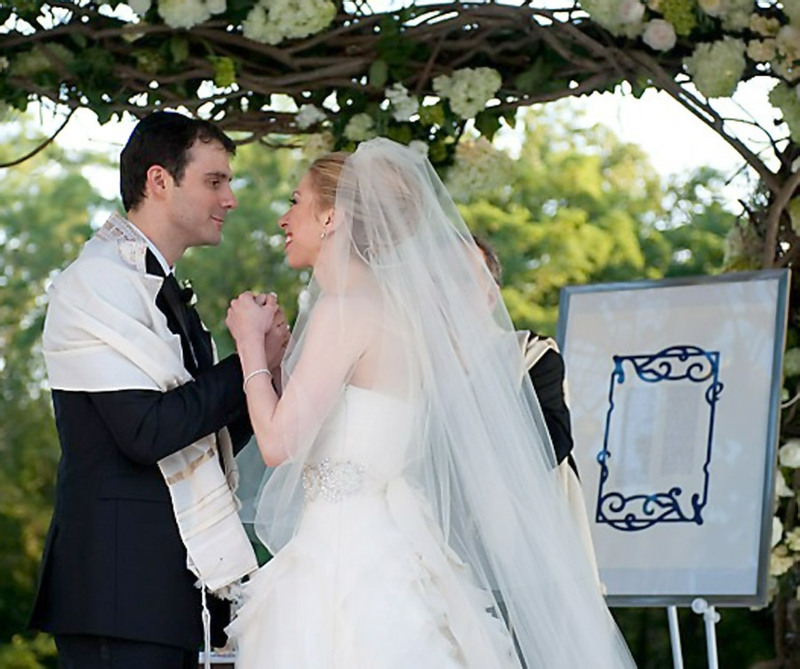 Along with their vows, there was a reading of the Seven Blessings, a Jewish tradition. The wedding party was formidable — a dozen bridesmaids and nearly as many groomsmen — and so too was security: Guests needed specially issued ID bracelets to board a bus to the ceremony. A few sharply dressed crashers who tried to blend in with the crowd were quickly rebuffed. The party raged until 4:30 a.m. But otherwise, the wedding of Bill and Hillary Clinton’s only child was noteworthy for being, you know, just a really nice wedding. Large? Definitely (about 400 guests). Lavish? Sure (though a longtime family friend scoffed at seven-figure estimates floating through the media). But not over-the-top, and not crammed with celebs. The dinner: Catered by the St. Regis Hotel in New York, it was “okay,” a guest said — short ribs, Atlantic char, a vegetarian option, and gluten-free rolls. The gluten-intolerant bride also selected a gluten-free cake from La Tulipe. The flowers: roses and hydrangeas, all purpley-pinky-blue. It was a hue that corresponded with the attendants’ gowns, which we’re told were actually wedding gowns dyed a plummy color, after they couldn’t find a traditional bridesmaid-style gown they liked. The guests: Terry McAuliffe. Madeleine Albright. Vernon Jordan. Lots from “Hillaryland”: Melanne Verveer, Maggie Williams, Capricia Marshall, Kelly Craighead. One of Chelsea’s ex-boyfriends from Stanford, Jeremy Kane, attended; however, her former beau Ian Klaus — so popular with her parents that they toasted him at his book party long after their breakup — was not in evidence. 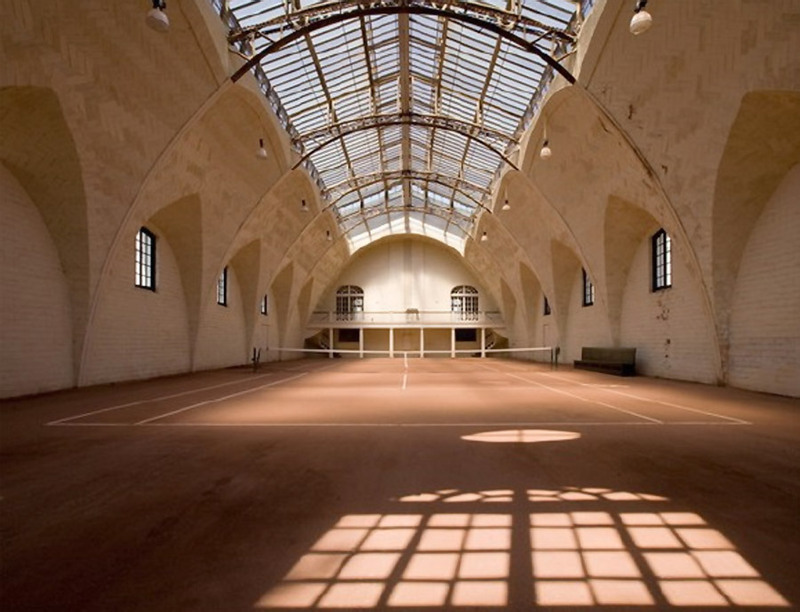 Only a few big donors — Alan Patricof and Steve Bing, but not Ron Burkle or Denise Rich. Frank Giustra, the Canadian mining magnate who has become one of the biggest backers of the former prez’s philanthropy, made the list. But no James Carville, no Paul Begala. And for all the Clintons’ Hollywood connections, very few showbiz types: Ted Danson and Mary Steenburgen were the biggest names. Barbra Streisand was not there; neither was Steven Spielberg. After the band wrapped up, guests moved to an after-party on the tennis courts, where a DJ played ’80s tunes and current Top-40 fare — you know, typical wedding stuff. Bill was on the dance floor; so was Hillary aide Huma Abedin with her new husband, Rep. Anthony Weiner. Bill gave one of the toasts, of course, saying that ever since his daughter had been old enough to formulate a thought, he had “been outnumbered” in his household, two to one. Now, with a son-in-law, he said, “the playing field is even. I have someone else on my side.” The kind of welcome that any old dad might give, at any old wedding. 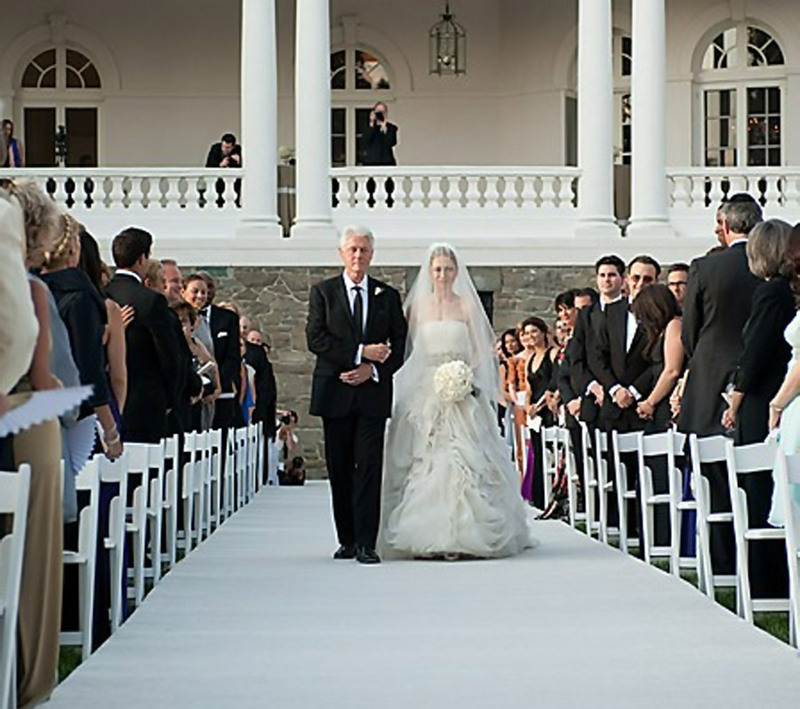 I wish them the best, here are some Chelsea Clinton wedding photos I want to share with everyone!! 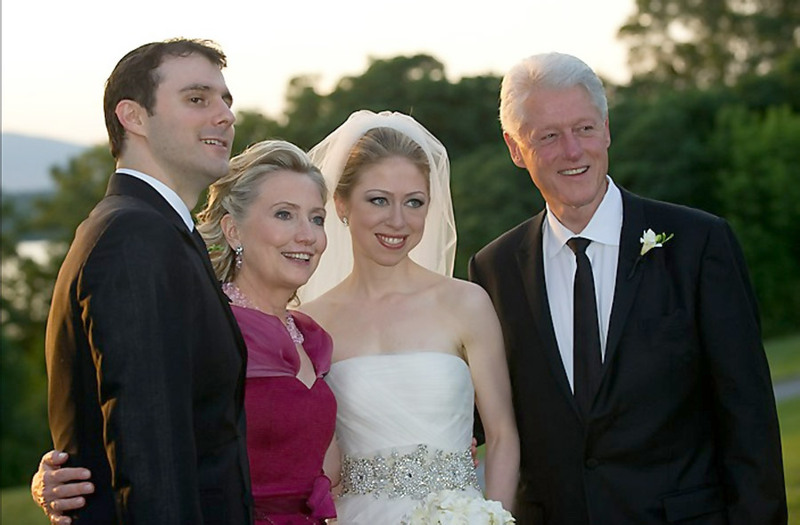 Marc Mezvinsky, Hillary Clinton, Chelsea Clinton, Bill Clinton pose as a family in this wedding picture. What picture is your favorite? How long do you think this marriage will last? < Previous Wedding Invitations online? Yes or No? It sounds like a beautiful wedding. They make a beautiful couple. It wonderful to hear is was more of a family wedding rather than a party extravaganza. it was every girl’s dream of a wedding. how come i don””””””’t see the groom’s parents?i wish them all the best; sure they will argue, quarrrel, maybe break up a little, but they will be back in each other’s arms, i pray.